The Fastest Web Hosting Worldwide Award is presented to the web hosting company that records the best average worldwide page-load speed during our 10-day test period. Of the 50 popular web hosts tested, DreamHost compiled an average worldwide page-load speed of only 1.1190 seconds. Further, it is worth noting that this speed was achieved by their lowest-priced hosting plan. Page-load speed is measured and recorded every 15 minutes for 10 days from 13 worldwide locations: Amsterdam, California, Colorado, Florida, Frankfurt, Hong Kong, London, Minnesota, Montreal, New York, Paris, Texas, and Virginia. With more than 1.5 million sites hosted, DreamHost must be doing something right — and our test results prove it. While speed is not the only measure of a great host, at NCM Online, we believe that it reflects a company’s commitment to providing customers with the best available technology. If our testing has taught us anything, it is that brand popularity is not necessarily a guarantee of quality. In fact, we found that the best results were generally achieved by owner-operated, mid-sized hosts that have chosen to apply significant resources to technology and staffing — rather than marketing and branding. DreamHost is certainly one such host. 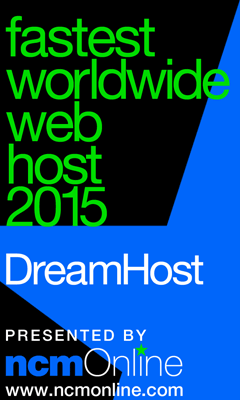 NCM Online is proud to present its Fastest Web Hosting Worldwide Award for 2015 to DreamHost.